The little village of San Cassiano lies at an altitude of 1,500 metres in the Dolomite mountains in north-eastern Italy. The building was originally constructed in 1850 as a parish priest house with an inn and a restaurant. 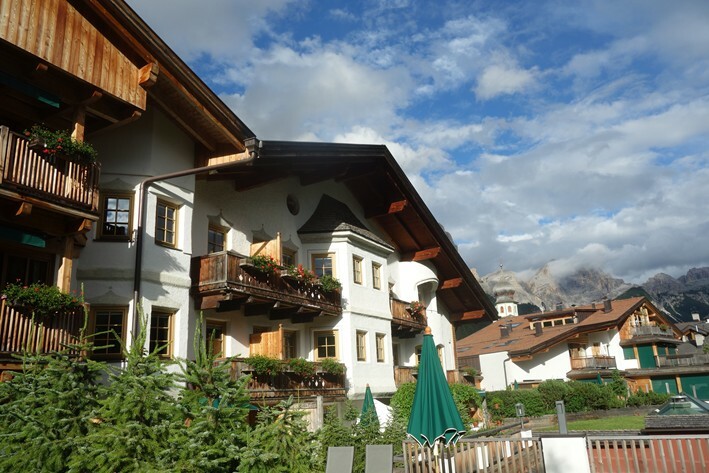 In 1940 it was bought by Engelbert Pizzinini and became a hotel, by then called Rosa Alpina. 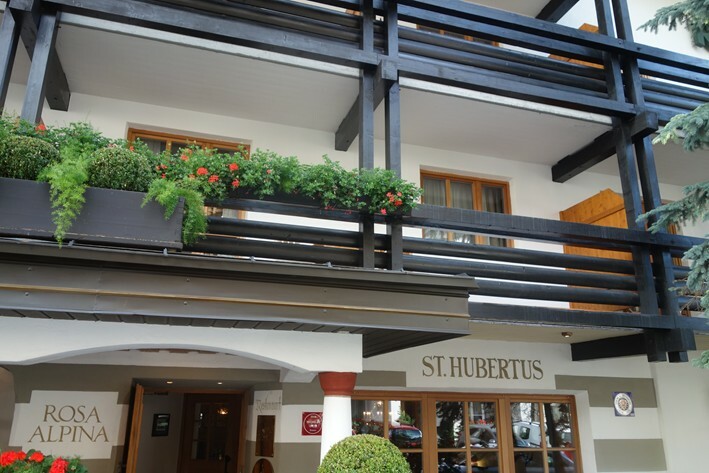 The hotel set up the restaurant St Hubertus in 1996 with chef Norbert Niederkofler, who gained a Michelin star for St Hubertus in 1990. In 2007 a second star was awarded, and in the 2018 guide the ultimate third star was granted. The natural setting is spectacular, looking up at the La Varella mountain, and with no outward sign that this sleepy location was once the scene of fierce trench and tunnel warfare in World War I. The village was an Austrian supply hub and the scene of bitter fighting between the Austrians and Italians. These days it is a peaceful spot, a ski resort in winter. To get to St Hubertus you can fly to Venice and drive north for 176 km (109 miles). Alternatively it is 213 km from Verona or 130km south of Innsbruck, which both have rather less well-served airports.. From Venice, the latter part of the journey involves a spectacular drive as you climb high into the mountains. The hotel operates as a ski lodge in the winter, closes in the spring and then opens again in the summer for hikers and bikers, and the occasional passing gourmet. 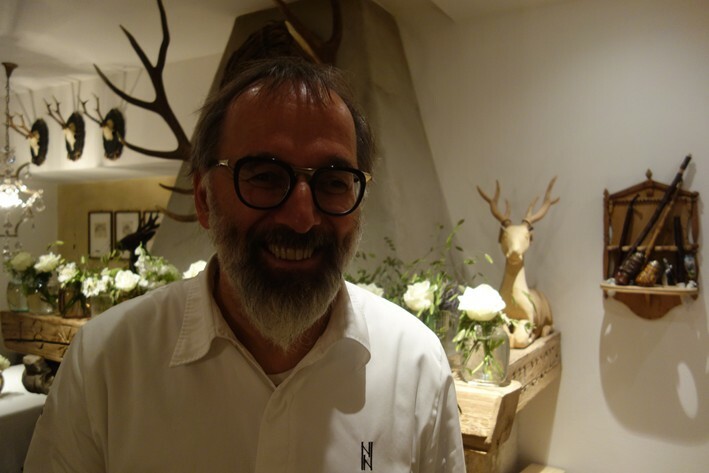 Head chef Norbert Niederkofler trained at Aubergine under legendary chef Eckhart Witzigmann, the first German chef to gain three Michelin stars. 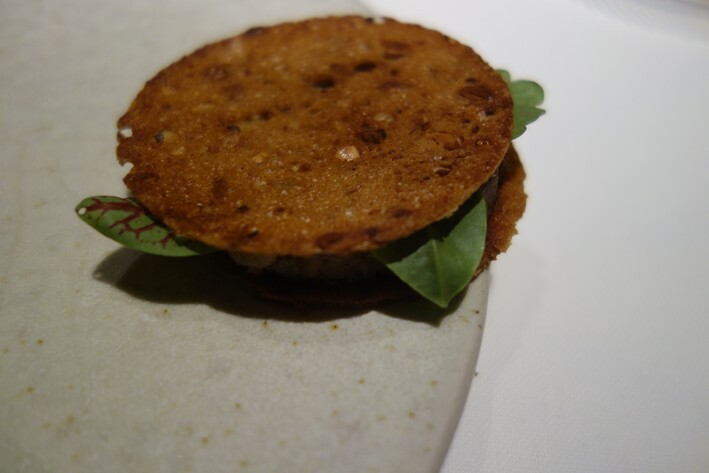 There were two tasting menus, one featuring the signature dishes of the restaurant at €200 (£179), and the other a lengthier selection at €250 (£223). Both were preceded by a series of canapés. The wine list was very extensive, stretching over sixty-one tightly packed pages and featuring wines from The Lebanon, Slovenia, Armenia and Kazakhstan as well more well-trodden wine regions. Sample labels were Keller Riesling Trocken S 2014at €65 for a bottle that you can find in the high street for €35, Damijan Podversic Kaplja 2008 at €90 compared to its retail price of €42 and Colternio-Schrekbichl Lafoa Cabernet Sauvignon 2013 at €130 for a wine that will set you back €59 in a shop. At the grander end of the list you could indulge in bottles like Domaine des Comtes Lafon Meursault Charmes 2011 at €410 compared to its retail price of €220, or Masseto Ornellaia 2012 at €980 for a wine whose current market value is €671. As can be seen, the markups were not excessive, and the list had great depth of coverage from the local region. 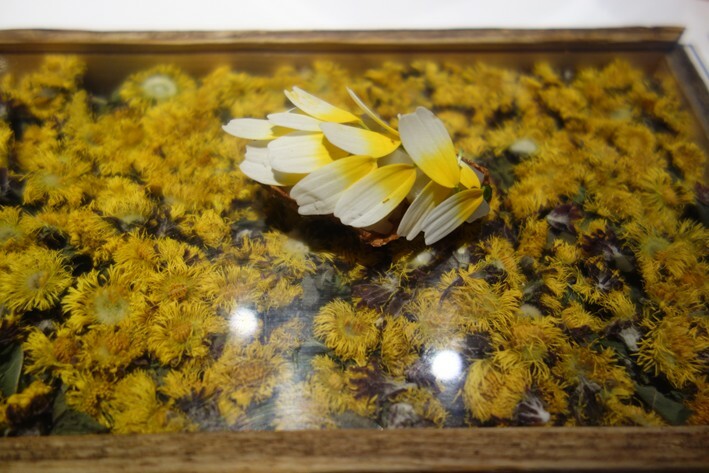 Our meal began with assorted nibbles, the first being Jerusalem artichoke crisps and flowers garnished with lemon balm petals. 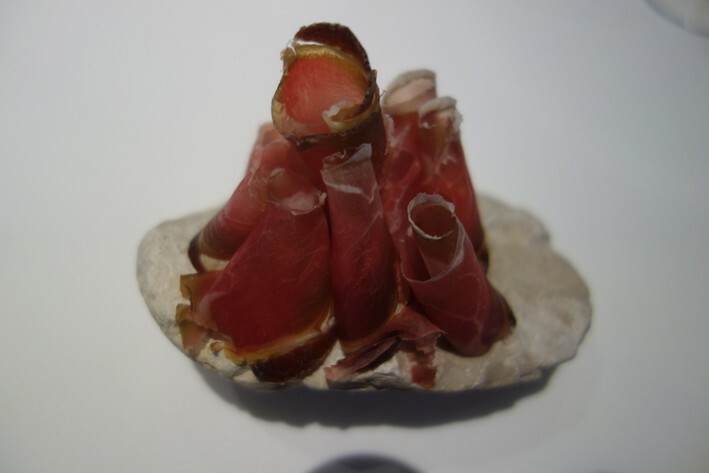 A take on a local Friuli dish was a little pie of potato, cheese and onion, and finally there was lamb ham that had been air-dried and cured for four months. 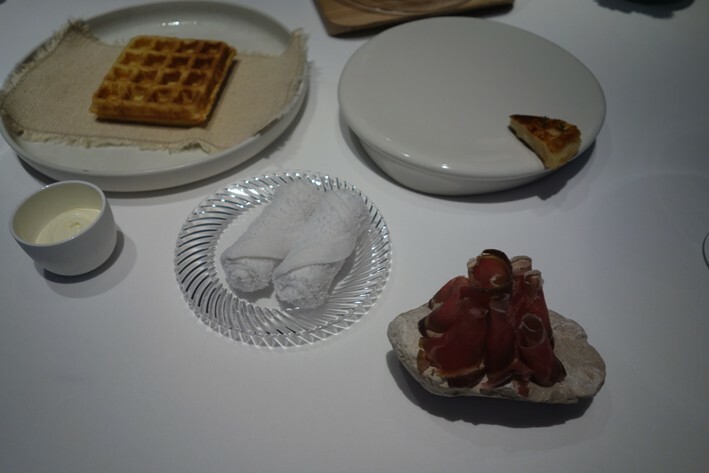 With the ham was a waffle along with some creme fraiche, The artichoke crisps were very pleasant, the pie reminiscent of gratin dauphinoise, and the ham was good, but the star dish was the waffle, which had superb texture and was far superior to the hard versions that you sometimes encounter in American hotels. Following this was trout from lake Iseo (in Lombardy) that had been marinated, smoked and garnished with a dust of white strawberries. 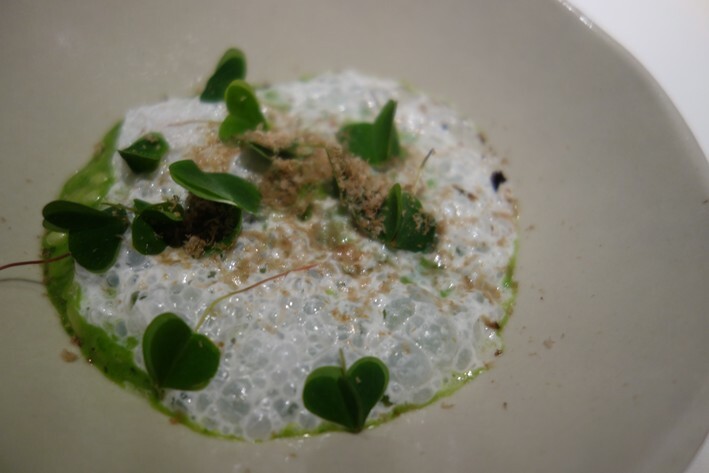 This came with a reduction of cream with flakes of horseradish and a granita of apple jus, pine tree sprouts, elderflower and sorrel. The trout was pleasant enough and the horseradish was a good idea to add a bit of bite, but the granita did not really add that much (average 17/20 nibbles). Bread was a choice of ciabatta and grissini. 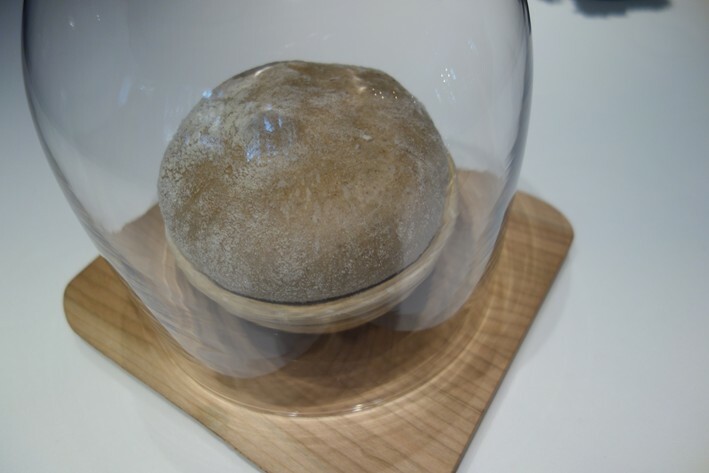 Additionally there was a dome containing raw sourdough displayed on the table, which was then taken away and baked. 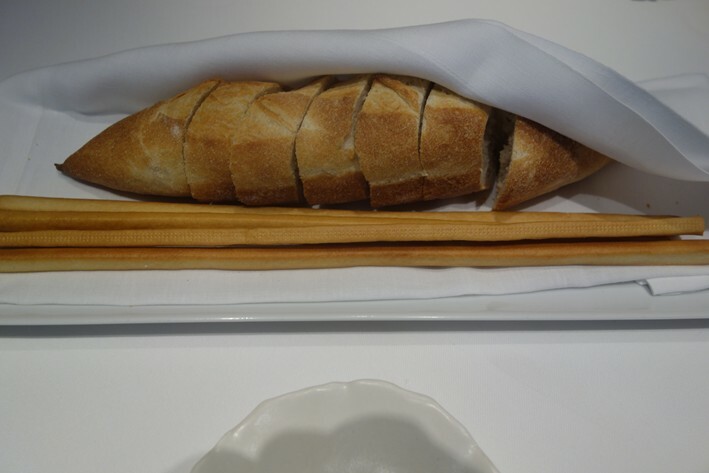 The ciabatta had unusually good texture, and the grissini was crisp. 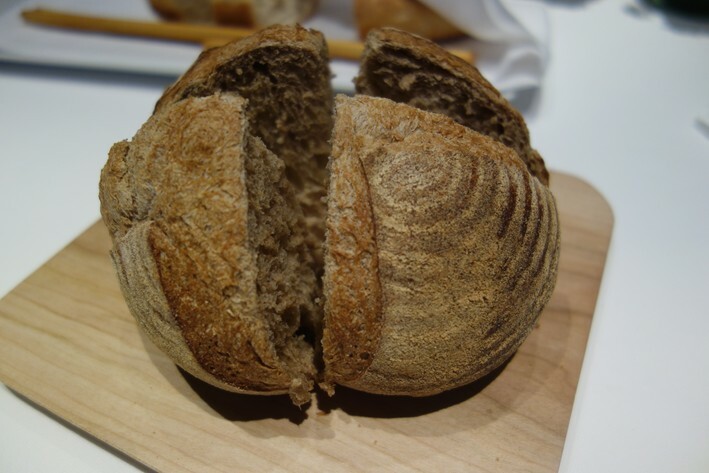 The sourdough was served warm and had a light crust, being very fluffy and delicate in texture (19/20 bread). 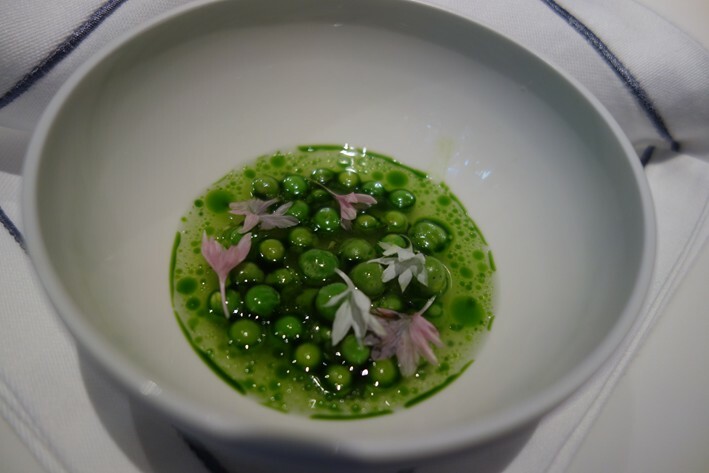 A dish of peas with a sauce of parsley, watercress and onion blossom suffered from the peas themselves being distinctly hard. Their flavour was reasonable and the sauce was fine, but the texture of the peas was just wrong (barely 14/20). 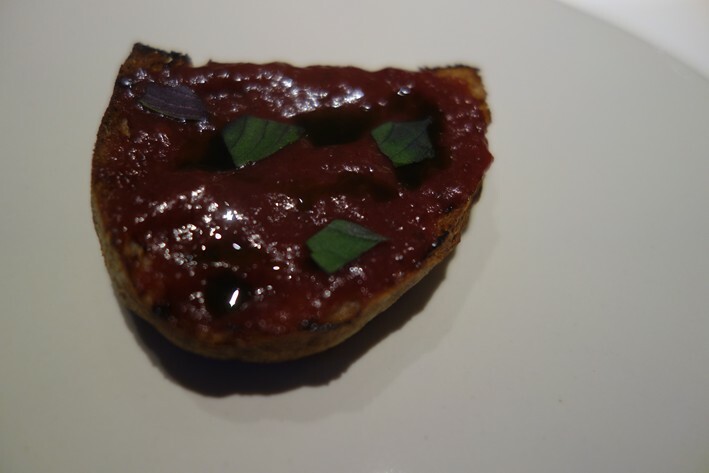 Bruschetta came with fermented plum and basil, instead of tomatoes, the idea being to use something local instead of tomatoes, which do not grow up here in the mountains. 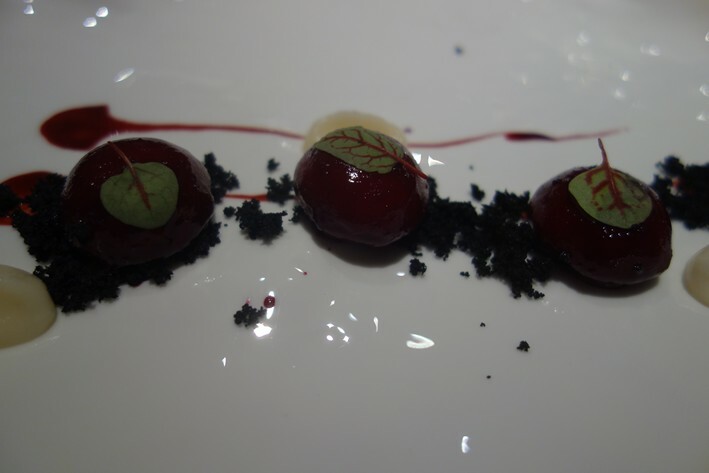 The plums were more acidic than tomatoes, but did have a taste that was reminiscent of them, though to be honest this just reminded me of how much better that some really good tomatoes, such as those I ate the day before at Le Calandre, would have tasted instead. This seemed to me a dish where the intellectual side of the kitchen got the better of the desire for flavour, pleasant enough though this was (15/20). 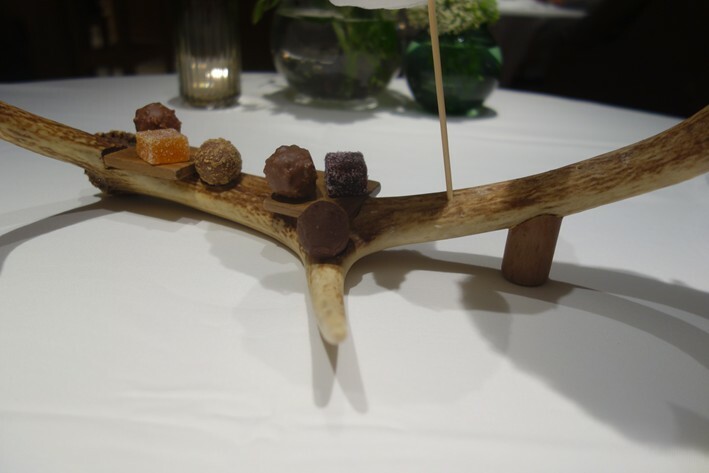 This was followed by a salad of mountain herbs that had been foraged by the chefs. 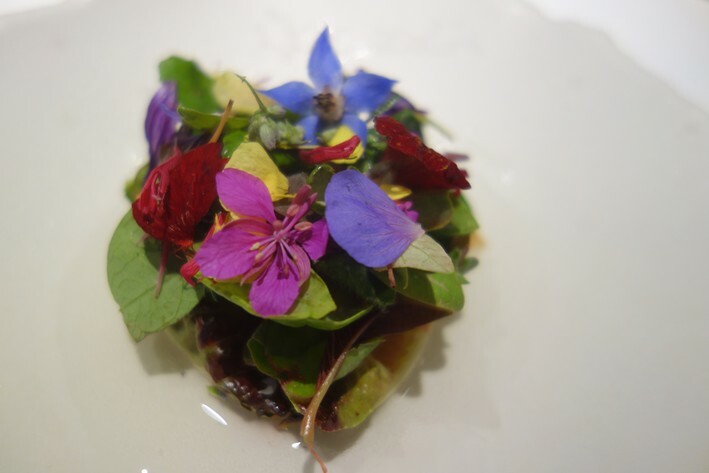 The leaves covered fried bread, Jerusalem artichokes, peas, radish and elderflower water. This was prettily presented, but ultimately was a salad that, instead of having a nicely balanced classical dressing, had a slightly medicinal taste due to the elderflower water. Moreover, the peas were again distinctly hard (14/20 is kind). 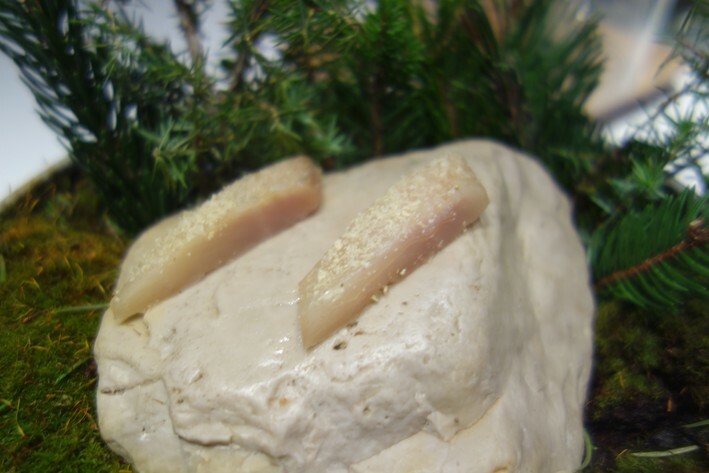 White fish tartare used a freshwater fish from a local lake. 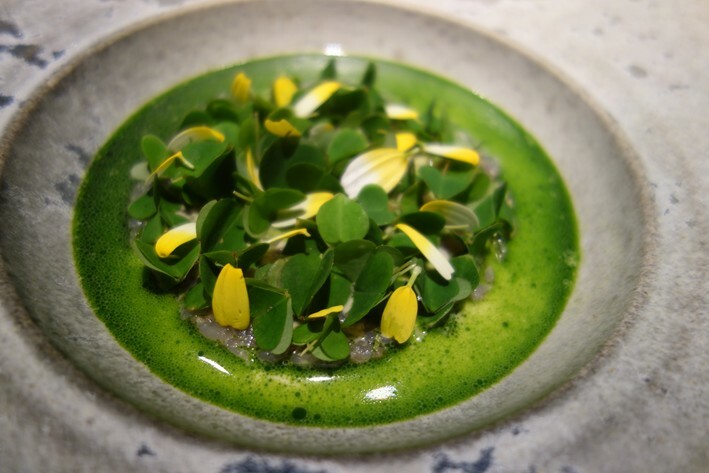 This came with leek and a sauce made from the bones of the fish as well as lovage oil, green apple, wild sorrel leaf and fried fish scales. 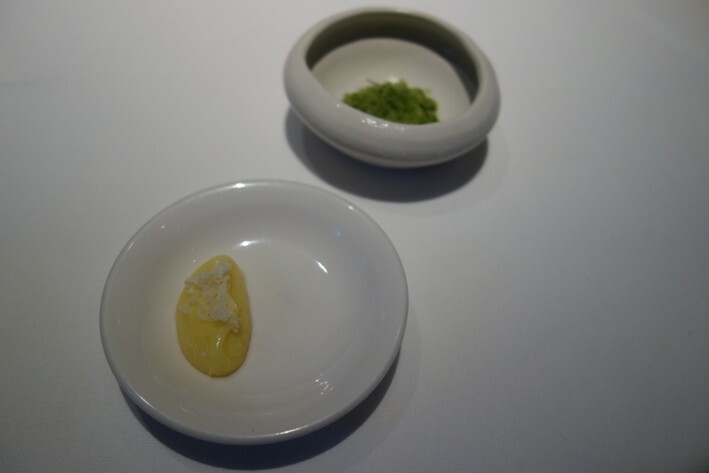 The dish was rather unusual in having a combination of cold fish with hot sauce but worked well enough, and the fish scales added a contrasting texture, the apple bringing acidity (16/20). 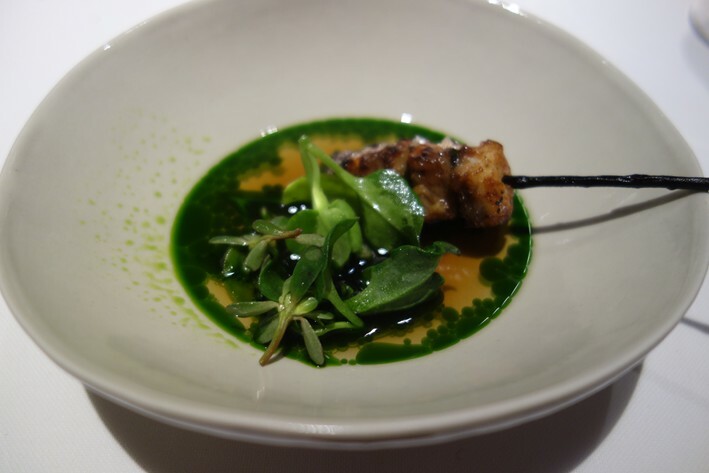 This was followed by sweetbread cooked in butter with cream of sorrel, with a jus of pine and sorrel. 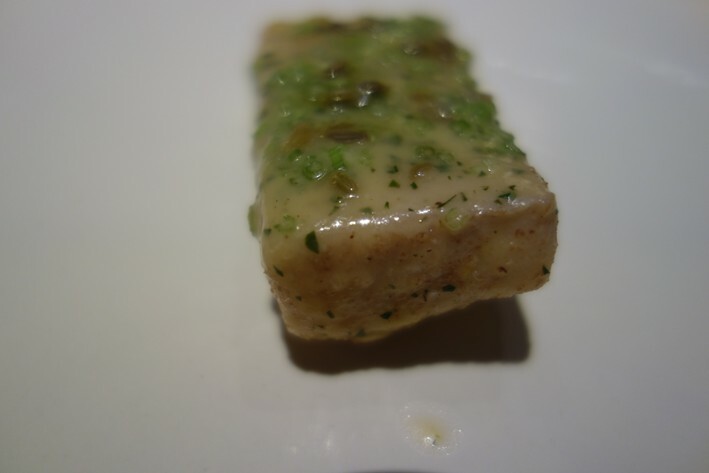 This was excellent, the sweetbread carefully cooked and having very good texture, the sauce with it a light contrast to the richness of the offal (18/20). 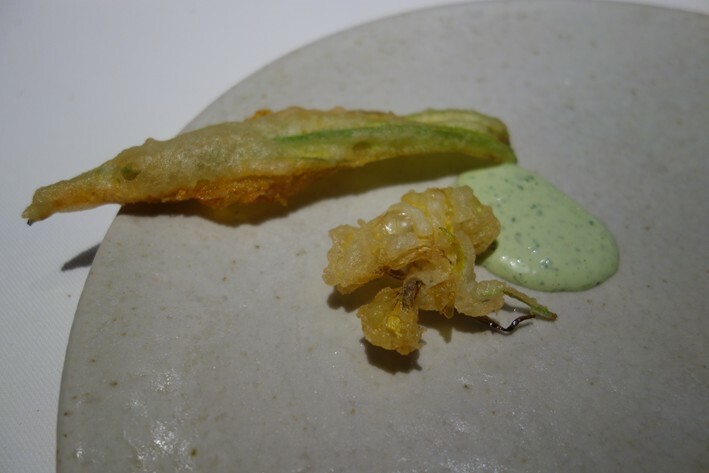 A non-carnivorous alternative was courgette flower tempura and nasturtium flower tempura with sorrel sauce. This was pleasant enough, though if you have eaten much tempura in Japan then this version left something to be desired. The batter was a touch greasy and heavier than the gossamer-light coating that is the ideal goal for tempura (15/20). Next was risotto of spinach and kefir milk (a fermented milk drink from the Caucasus mountains), with a grating of dried sheep meat that had been marinated in wine and left to dry for three months. The rice itself had good texture and the spinach was fine, the kefir milk bringing a vaguely sour note and the grated meat adding mainly texture rather than much flavour. It was all perfectly OK, but having eaten perfect saffron risotto at Le Calandre the previous night, I know which one I would rather have again (15/20). Beetroot gnocchi was filled with horseradish cream and was garnished with beetroot leaves. This came with a beer and bread crumble and daikon radish cream. This worked really well, the gnocchi having nice texture and there being plenty of spicy kick from the horseradish, the crumble bringing an extra texture (18/20). 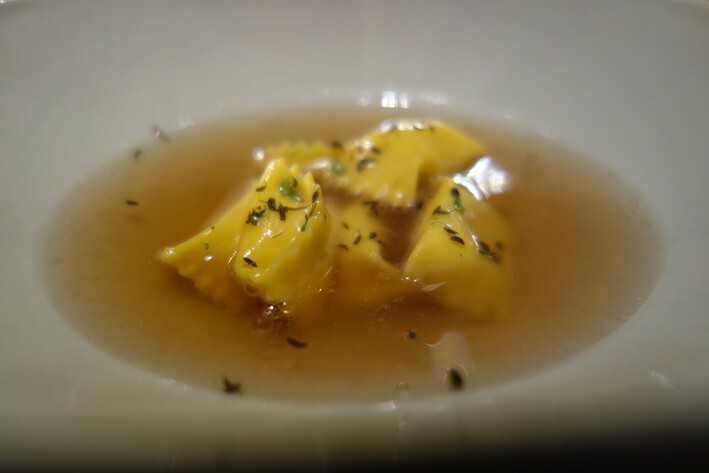 Ravioli of cheese from the Bergamot region near Milan was flavoured with wild cumin and came with a broth of rosemary and lemon thyme and dried mushrooms. This was also very successful, the pasta having lovely texture, the mushrooms providing umami and the herbs nicely lifting the flavour (18/20). Trout was cooked with plums and butter and came with a cream of plums, lovage and parsley stalks. This was a pleasant dish, but though using trout fits with the alpine cuisine theme, in truth trout is never going to compete on flavour with fish such as turbot or sea bass, pretty much whatever you do with it (16/20). 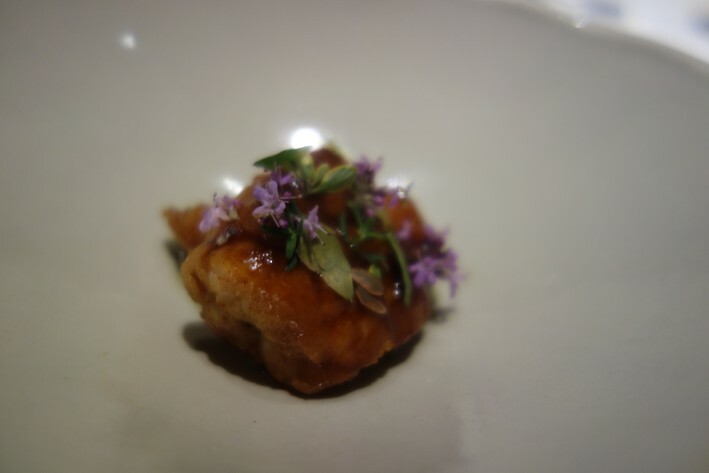 My final savoury course was suckling pig belly, slow cooked for 24 hours, the skin grilled, and served with nasturtium cream, elderflower, wild garlic seeds and a sauce of the pig with burnt onions. Although the skin was introduced as being “crisp” it was anything but, and so ultimately you had fairly fatty pork belly with a non-crisp skin, when what would have been nice would be proper crackling (as indeed came with the suckling pig I had eaten at Le Calandre the previous night). The sauce was quite good and the garlic flavour was nice but the main event itself was just too fatty. The dish was rescued by a second serving of the pig, a little sandwich of the pig head slowly cooked with cereal chips and flavoured within local mustard, served with a glass of sparkling apple juice. 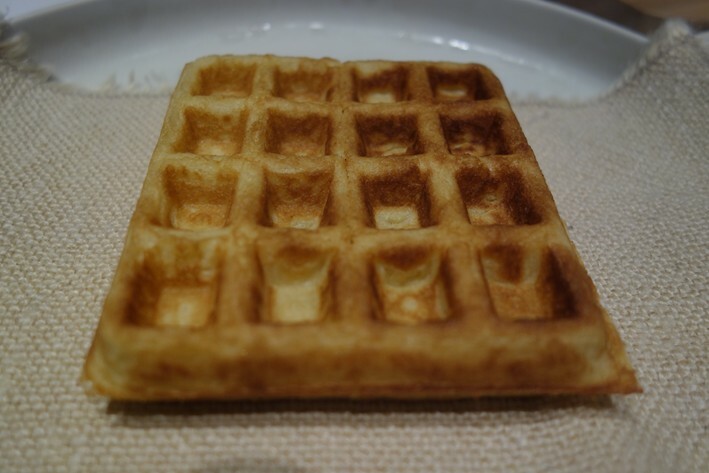 This had all the qualities that the belly lacked, and was most enjoyable. If I average the two servings then I can get the score for this dish overall up to perhaps 16/20, but the second serving was dramatically better than the first. 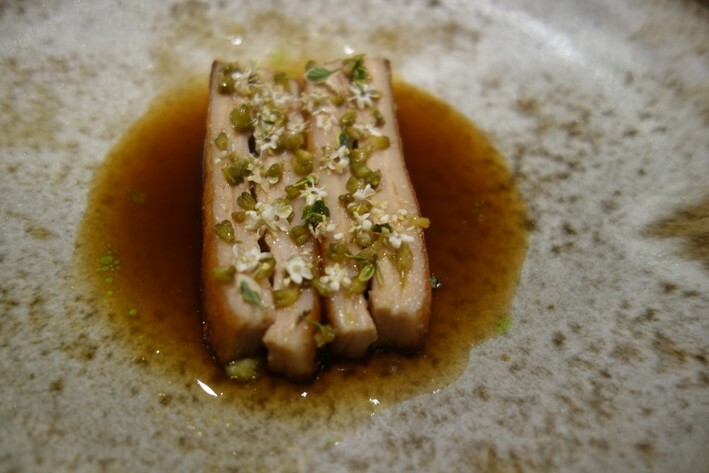 A non-carnivorous alternative was eel that had been smoked and glazed with hay and a smoked consommé of eel and chive oil. This was lovely, the gentle smoky flavour note pleasing, the eel itself having excellent flavour (18/20). Two desserts were served. 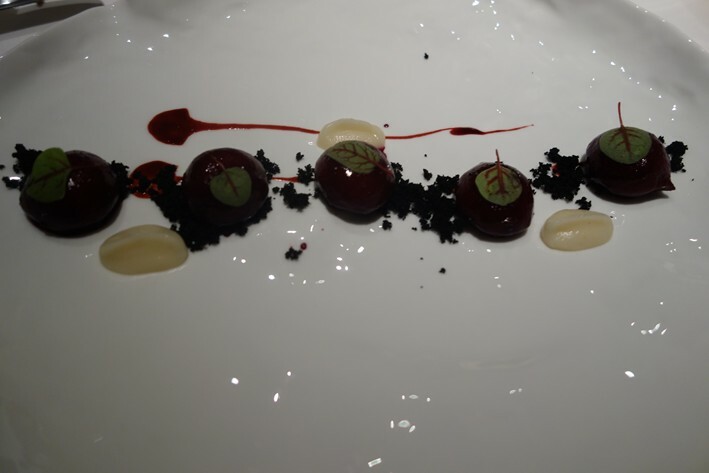 A cranberry sphere was filled with creme patissiere, served with yoghurt cream and a base of gianduja chocolate, a chocolate and hazelnut paste that traces its origins back to Napoleonic times, when a Turin chocolatier called Michele Prochet, faced with a shortage of chocolate due to Napoleon’s blockade of British imports, eked out the chocolate available by mixing it with hazelnuts from nearby Langhe. The dish was completed with a cream sorbet and a garnish of cranberry chip, along with some local raspberries. 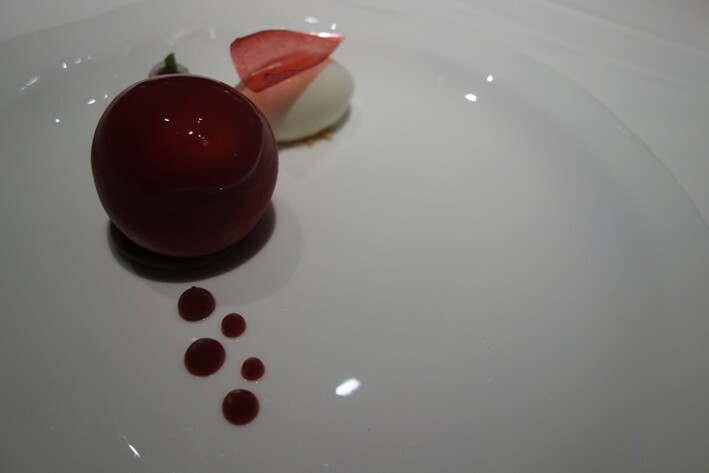 This was a very successful dish, the acidity of the fruit nicely balancing the richness of the cream and chocolate (18/20). Finally there was a classic tarte tatin, using preserved local apples and served with vanilla ice cream, Although the pastry was good, the out of season apples themselves lacked sufficient sharpness compared to a variety like say, Cox Orange Pippin, and moreover when the tatin arrived it was lukewarm rather than hot, and should have been slightly more caramelised. I am a huge fan of tarte tatin, but in truth this was not an especially great rendition. Fortunately the vanilla ice cream, though hardly fitting with the local ingredients ethos, was lovely (16/20 overall). Coffee was a Lavazza premium blend called Itiera using Brazilian beans, and was certainly a step up from regular Lavazza. 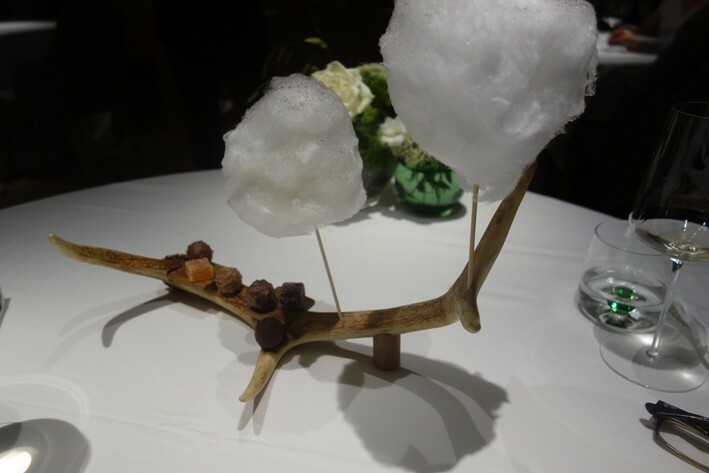 This came with a selection of petit fours: apricot jelly, red fruit jelly, salted caramel, a cassis chocolate, Ferraro Rocher with hazelnuts and finally cotton candy with coffee powder. The jellies had good texture, though the salted caramel was very salty, and the cotton candy was extremely sweet. Service was very attentive, and arguably overly so at times. Crumbs were brushed away after every course until we asked them to stop. At one point I put down my wine glass only for it and my water glass to be rearranged so that they were neatly next to each other, which seemed a bit OCD. At the end of the savoury courses an entire extra tablecloth was rolled out over our completely pristine existing tablecloth, for reasons that elude me. Wine topping up was similarly over fussy, with glasses topped up in tiny increments, requiring seemingly endless iterations. I was reminded of three star chef Nico Ladenis, who at a restaurant dinner one night became so fed up with the wine waiter topping his glass up after every sip that he grabbed the bottle and put it under the table. The staff were clearly well meaning, but at some point such service can cross a line from attentive into obsessive. The bill came to €274 (£245) per head. If you ordered the shorter menu and shared a modest bottle of wine then a typical cost per person might come to around £235. Overall the meal seemed to be somewhat a case of style over substance at times. 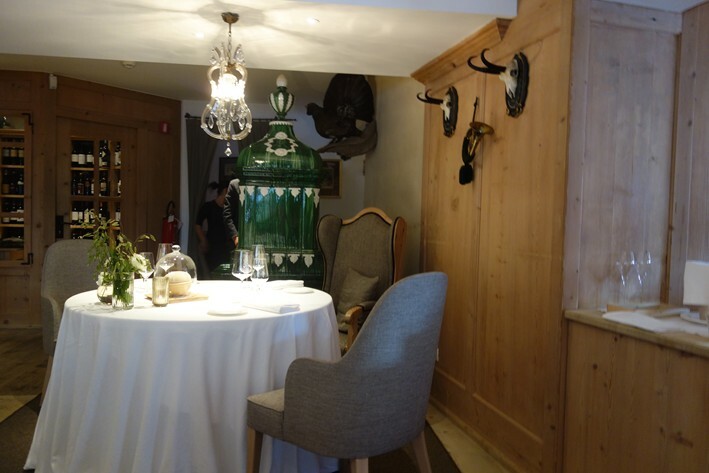 There was so much emphasis from the staff of what Hollywood calls the “backstory”: the alpine setting, the foraging, the obsession with avoiding waste, that it felt a bit like a case of philosophy over flavour. There were some very good dishes, and technically the cooking was generally skilful, but there were still some areas that could be improved e.g. 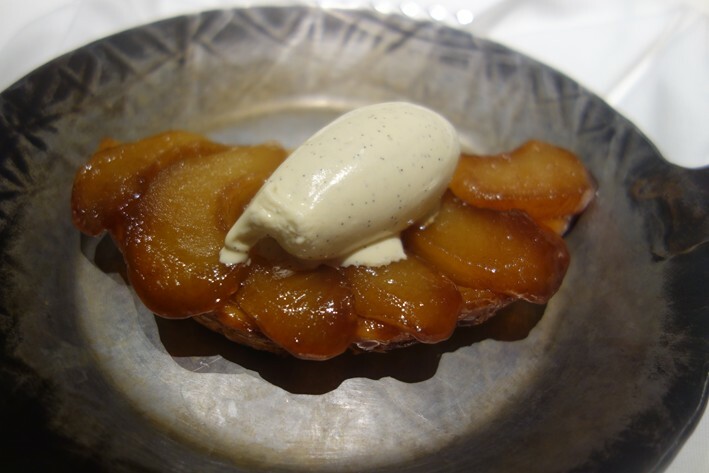 see my comments on the tarte tatin. Certainly the setting of the restaurant is lovely and there are things to like about much of the food here, but I would have hoped for greater consistency and a little more “wow” factor to justify its elevation to three stars.